Such a sweet and thoughtful gift! Super fun colors, cuts and sentiment, too! 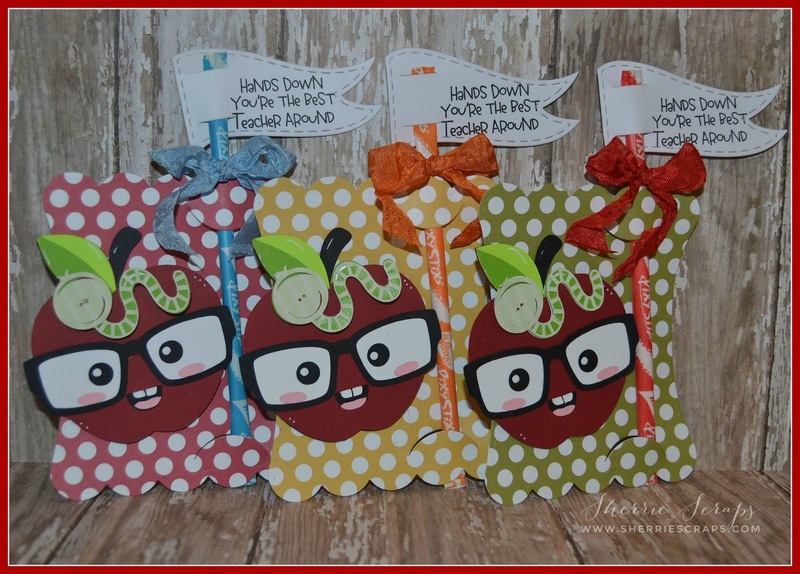 Thanks so much for playing along with the Smarty Pants challenge at Pretty Paper, Pretty Ribbons! Oh my gosh, so stinkin' adorable, Sherrie!! I can't quit smiling!! 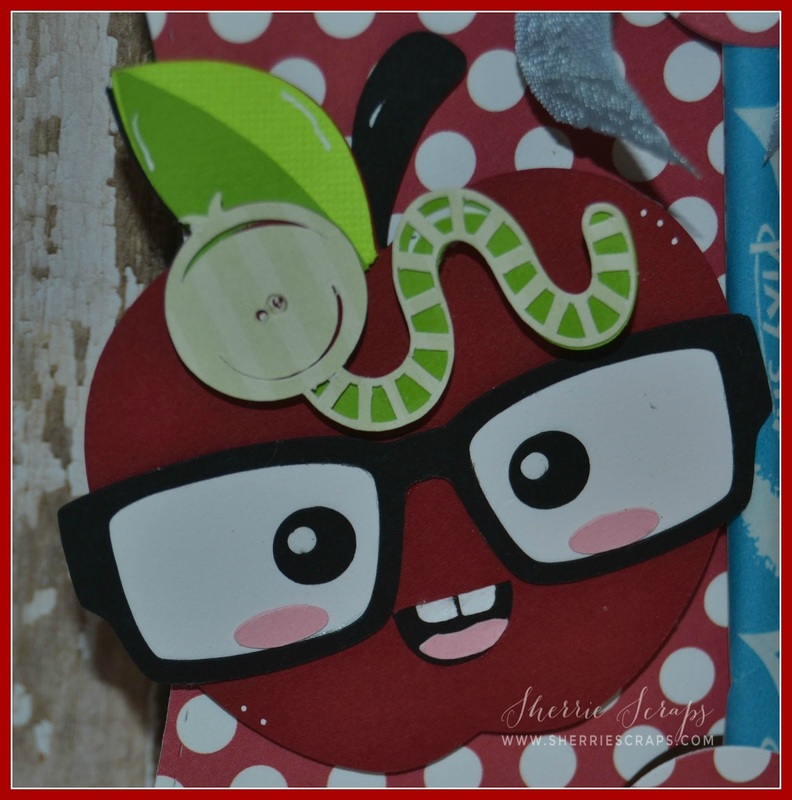 Who would've thought nerdy apples could be so darn cute!! I love the faces on the worms, too!! What perfect back to school treats these are!! I love the pencil banner!! Awesome my friend and so, so fun!! 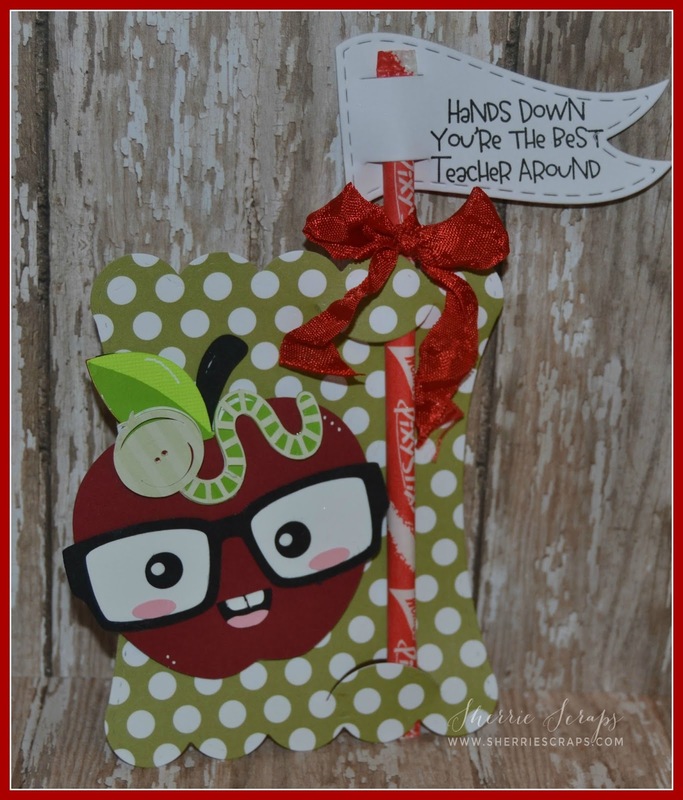 This is a super cute treat, and I am sure the teachers that receive them will love them!! My grandkids have already been back to school for 2 weeks!! Boy, wherever did the summer go!! Cute little nerdy apples!! What a wonderful teacher treat! This is so cute! What a "sweet" and thoughtful treat for the Teacher! These are soooooooo fun! LOVING those apples and the worms!!!!!! WOW....these are as cute as they come. I love your fabulous apples and those worms are so fun. Thanks for joining us at DoubleClick Skittles. Oh my how cute are these... You sure will be spoiling those teacher's! LOL! Absolutely adorable project! Love the apples with those worms! OMGoodness, I am sure any teacher would love to have this, wonderful job, thanks so much for joining the Smarty Pants challenge! Sherrie, this is adorable! You always make the sweetest treat packaging... I am so tickled by this! The apple is darling and the sentiment is heartwarming. Lovely work, my dear friend! Just look how cute these are!! I love the fun flags and the bright colors. You always share the most fun little treats and decor, Sherrie! I bet these were a hit for back to school! Totally cute and fun!! I love the cute stamped tag! The kids will love this!! OMG these are so cute! I love how you used the dies. Thanks for joining the Jaded Blossom monthly challenge this month! OMG these are so super ADORABLE Sherrie!!! What a cute back to school project!! LOVE LOVE LOVE those adorable apples! Sherrie ~ oh my word these are ADORABLE too! All your work is always ADORABLE and PERFECT! LOVE the colors and what a fun treat for anyone! Very very cute! Thanks for linking up at 3 Girl JAM Challenges! These are adorable!!! SO fun and cute! Another wonderful project. Thanks for sharing and joining us at 3 Girl JAM! Good gosh, these are darling. I always love checking out your projects. Thanks for joining the DoubleClick Skittles Challenge. These nerdy apples are the super cutest! The sentiment is just perfect! Thanks for joining us over at the DoubleClick Skittles Challenge! DT Member Carri~Abusybee Skittles! This is so adorable!!! Love it and I'm sure the teachers will love them as well:) Thank You for sharing and for playing along with us over Pretty Paper, Pretty Ribbons for our at Smarty Pants challenge. Awesome treats! I need to find some time to make a few for my class this year. I just bought this die, so that will help with time. Thank you for joining our “Bug” Challenge this week at DoubleClick Skittles. These are SUPER CUTE! Love that adorable apple and the pixie stix with the flag on them! Thanks for playing along at Jaded Blossom! SPECTACULAR and SO SUPER CUTE!!! Love how charming and fun these are - how special the teachers that get these must feel!! You really rocked at this!!! So very glad you joined us for the Use a Bug Challenge over at DoubleClick!! We are so glad you linked up with us!! Hope to see you again soon!!! Oh these are SOOO CUTE! I think they turned out perfect! Sherrie these treats are too cute! This totally scraplift worthy! This little apple was a great back to school freebie! So glad I have it too! Good luck on the challenge!